Above, Nippon Maru is shown leaving Amsterdam after her first visit to the Dutch capital on the 24th of may 2001. On the 8th of march 1990, Mitsui OSK Lines launched a new Nippon Maru from the Mitsubishi Heavy Industries yard at Kobe, Japan. Mitsui OSK Lines was formed in 1964, when Osaka Shosen Kaisha and the Mitsui Steamship Company merged in a time when Japan restructured its marine companies into six major companies. Mitsui OSK Lines became the biggest, sailing with 83 vessels, almost all freighters. OSK Lines dated from 1884 and Mitsui Lines was slightly older, founded in 1876. 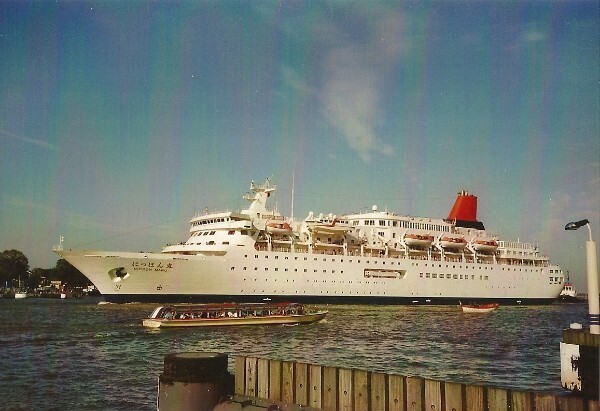 In 1970, Mitsui OSK Passenger Company was formed by Mitsui OSK Lines and it sailed with three small passengerships, the only ocean-going passengerships in Japan at that time. In september 1988, Japans first real cruiseship was launched under the name Fuji Maru. 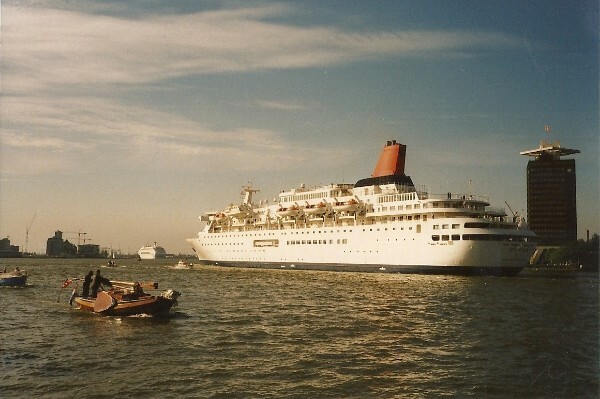 The ship measured 23.340 tons and started sailing Asian cruises out of Tokio at the 29th of april 1989. It was the first cruiseship in Japan that had features like a swimming pool, a dining room and a theater. She was followed by Nippon Maru, a close sistership but with many differences, when she set sail for the first time from Tokio to Hongkong and Taiwan at the 27th of september 1990. Somewhat smaller then her earlier sister, Nippon Maru measuring 21.903 tons, she can sail with a maximum of 607 passengers in 202 cabins. Some 160 crewmembers take care of them having a great cruise in Asian waters. The ship is 166,65 meters long and 28 meters wide. Rather small, but in Japan cruising just started to be a way of holidaymaking and so these ships were in Japanese standards big and innovating. In 2001, Nippon Maru was the first Japanese cruiseship that sailed on a worldcruise, also taking her to Amsterdam where these pictures were taken at the 24th of may. In the winter of 2009 and 2010, the ship was rebuild and mdernized during a four months refit, although her profile changed just a little. This of course with the exception of her changed hullcolouring. Instead of the all-white, the ship recieved a royal blue hull and a red band, making her appearance more attractive and classy in my opinion. She started sailings again at the 26st of march 2010 in her new appearance, sailing a three day cruise around the Izu Islands near Tokio. Nippon Maru leaving Amsterdam, closely following the first Crown Princess of Princess Cruises, that can be seen in the distance.